Fountain Valley, CA – August 13, 2014 − HyperX®, a division of Kingston Technology Company, Inc., the independent world leader in memory products, today announced HyperX FURY USB Flash drive, an entry-level storage device for budget-conscious gamers and enthusiasts. HyperX FURY USB is the latest addition to the FURY entry-level family which includes DRAM and an SSD. HyperX FURY USB has an aggressive case design with colored aluminum accents to stand out from other USB Flash drives while complementing PCs and consoles1. 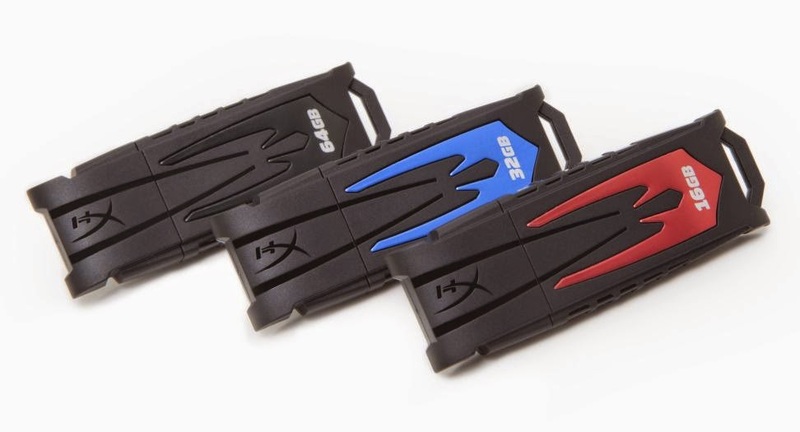 It is available in 16GB (red), 32GB (blue) and 64GB (black) and is ideal for storing games, music, photos, videos and files. HyperX FURY USB keeps data moving with USB 3.0 performance (90MB/s read, 30MB/s write) and is also USB 2.0 compatible. The HyperX FURY USB is backed by a 5-year warranty, free technical support and legendary HyperX reliability. For more information visit the HyperX home page. HyperX is the high-performance product division of Kingston Technology encompassing high-speed DDR3 memory, SSDs, USB Flash drives, and headsets. Targeted at gamers, overclockers and enthusiasts, HyperX is known throughout the world for quality, performance and innovation. HyperX is committed to eSports as it sponsors over 20 teams globally and is the main sponsor of Intel Extreme Masters. HyperX can be found at many shows including Brasil Game Show, China Joy, DreamHack and PAX. · Console Compatibility1: with PS3™, PS4™ and Xbox 360. Functionality varies by console. 1 Refer to console manufacturer for compatibility details. Xbox360 recognizes FAT32 format only. 2 Minimum quantity required. Performed at the factory. 3 Some of the listed capacity on a Flash storage device is used for formatting and other functions and is thus not available for data storage. As such, the actual available capacity for data storage is less than what is listed on the products. For more information, go to Kingston’s Flash Guide at kingston.com/flashguide. 4 Speed may vary due to host hardware, software and usage. 5 Requires a host device with a USB 3.0 port.